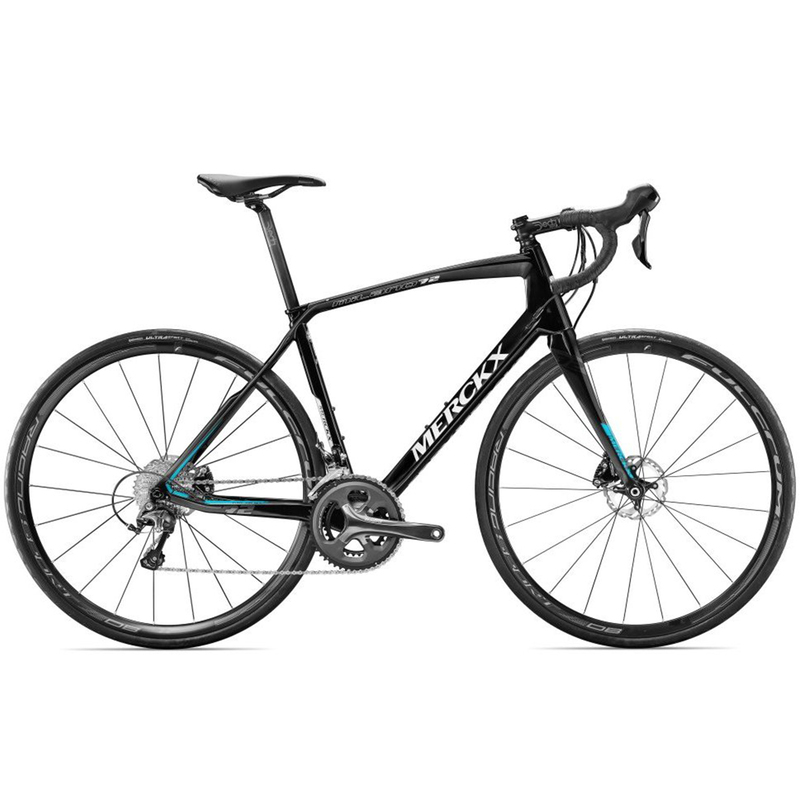 The Eddy Merckx Milano 72 Tiagra Disc is a great value-for-money carbon fibre ladies road bike that features hydraulic disc brakes and is built ready to meet the demands of long rides in unpredictable weather and difficult conditions. If you’re looking to take your riding to the next level the Milano 72 will not disappoint; with a lightweight carbon frame featuring women-specific geometry and a dependable Shimano Tiagra 4700 groupset the Milano 72 is bound to enhance your cycling performance. The Milano 72 takes its name from the hard-fought victory by Eddy Merckx in the 1972 Giro d'Italia. After winning four stages he finished first overall in Milan to reinforce his supremacy as the top tour rider, with Eddy directly influencing the development of the Milano 72 Tiagra you are guaranteed a competitive carbon road bike that has been designed to be comfortable and compliant with a little flex in the seatstays. The user-friendly technology doesn’t end with the frame though; the addition of predictable Shimano BR-RS405 hydraulic brakes provides you with confidence inspiring control even when braking on steep, wet and unpredictable descents. The Eddy Merckx Milano 72 includes a Shimano Tiagra groupset featuring a compact chainset with 50/34T chainrings combined with a wide ratio 11/32T cassette providing a versatile range of gears to help you climb steep hills and stay feeling fresher on longer rides. With specially selected components such as a comfortable women-specific Prologo Kappa Space STN saddle and Deda stem, bars and seatpost Merckx have ensured that all contact points remain comfortable even during your longer rides. The Milano 72 disc road bike features thru axles for increased stiffness, enhanced steering and no disc rotor rub as well as a pair of lightweight but durable Fulcrum Racing Sport disc specific wheels to complete this capable, confidence inspiring package. Looks great. Have not ridden it hard yet, but very comfortable riding position for endurance and easy to get into the drop handles for speed. A bit heavier than I expected...feels like about 9.5Kg. Gear shifting is smooth, but not hugely impressed by the disc brakes which don't have the stopping power I expected. Certainly no better than reasonable rim brakes. Overall, good value at this price- I would buy it again, but chose rim breaks to shave the price and weight down a bit further. Very pleased with this bike. It looks great and rides lovely. Improved my speed and hill climbing is so much easier! Great bike and would definitely recommend it. The bike itself is very well reviewed elsewhere and it certainly lives up to the promise in terms of build quality and componentry. I cannot attest to the ride as it will be a very nice present for someone. Merlin Cycles were very easy to deal with and the speed of delivery and information provided so that I could be in when it was delivered was great.